Remembering the nature of our last conversation, I’ve opted to season my words by sharing these concerns with you by letter. Free from my stammering and stuttering, this letter might yield a more fruitful dialogue. Remember the young adults retreat in the middle of nowhere I told you about? I actually signed up last minute and journeyed there with a friend through the snowfall and sunset. And though it was covered by snow when we arrived, I knew immediately that I was on familiar ground. I was rushed by nostalgia as I watched over the still, frozen lake near the cabins. The footsteps in the snow were mine, albeit from different boots. A decade ago, you and I left footprints near the lake. 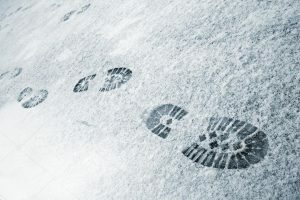 Now, your footprints like your soul, appear lost—covered by snow and sin. Maybe I should have seen it coming. You were too burdened by anxiety to squeeze through the narrow gate. You stopped storing scripture into your heart. You stopped repenting. You stopped fellowship with me. You stopped fellowship with God. You started walking with the wicked, you stood with sinners, and now you sit with scoffers. It seems like yesterday that we vowed to live the rest of our days for God. But today you live in sin, and tomorrow you might live in Hell. Though you are not afraid, I am afraid for you. Sometimes I pray that Christ would return quickly, then I think of you, and I ask him to wait some more. I plead with Christ that He would not return until you have first returned to him. I ask him to grant you repentance, even though you’re unwilling. I ask him to renew your mind even as you conform to the world. I ask him to remember you, though you have forgotten him. Do you remember how you loved Peter’s words? Do you remember whom you have left, my dear friend? Have you forgotten that Christ has the words of eternal life? Have you forgotten that you believed and knew that He is the Holy One of God? Whom have you left your Saviour for, my dear friend? What have you gained in the world that makes betraying your Lord worth it? Won’t you repent? Won’t you remember that Jesus Christ died for your sins? Do you not know that Jesus Christ resurrected for your justification? Today, it’s not too late to return to the Saviour you believed in years ago. But it might be too late tomorrow. Won’t you repent?